"The Son of Man will put the sheep (good people) on his right and the goats (bad people) on his left. "Then the king will say to those good people on his right, 'Come. My Father has given you great blessings. Come and get the kingdom God promised you. That kingdom has been prepared for you since the world was made. You can have this kingdom, because I was hungry and you gave me food to eat. I was thirsty, and you gave me something to drink. I was alone and away from home, and you invited me into your home. I was without clothes, and you gave me something to wear. I was sick, and you cared for me. I was in prison, and you came to visit me.' "Then the good people will answer, 'Lord, when did we see you hungry and give you food? When did we see you thirsty and give you something to drink? When did we see you alone and away from home and invite you into our home? When did we see you without clothes and give you something to wear? When did we see you sick or in prison and care for you?' "Then the king will answer, 'I tell you the truth. Anything you did for any of my people here, you also did for me.'" 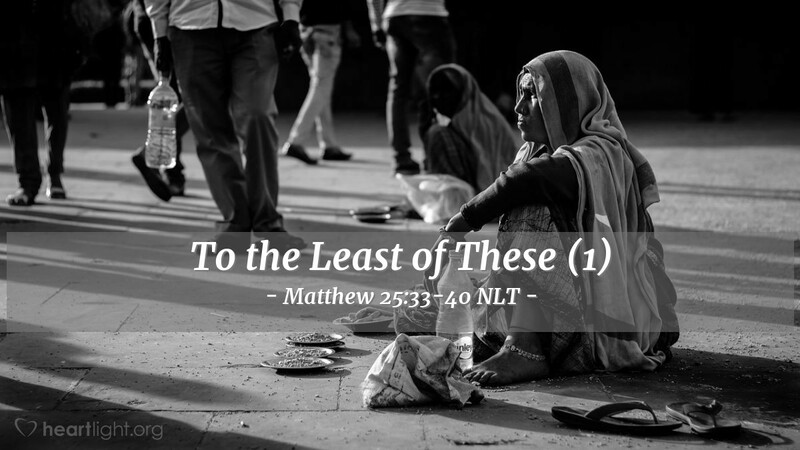 While Jesus wants us to be compassionate and caring to all people, this passage is primarily about how we treat those the world seems to think are the least, but whom Jesus values as his disciples. The least, the last, and the left out become the primary ones who come to Jesus and find life, love, and lasting hope. Jesus' promise is that as we care for those in Jesus' community, no matter their circumstance, we are caring for him. We can actually experience Immanuel, God with us, when we care for disciples of Jesus! O Father of all people and lover of all of your children, give me a heart of concern and compassion for those who are left out and forgotten, especially those abandoned by the world who are your disciples. Please give me courage to identify with those who the world not only shuns and shames, but those the world persecutes and ridicules. Father, give me a heart like Jesus for the people who most depend upon him. In the name of Jesus, my Savior, I pray. Amen.